There are plenty of options for straightening your teeth, whether it’s accounting for price, comfort, stability, or visibility. At Affordable Dental in Van Nuys, our team of general dentists and on-staff orthodontist have vast experience with several traditional and invisible braces options. If you have concerns about the alignment of your teeth, call us today to set up a consultation. 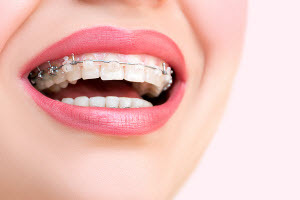 Traditional Metal Braces have been used for decades to straighten teeth using metal brackets, rubber bands, and wires. While this option is more visible than others, it is also a stable and trusted orthodontic treatment method. You can choose from multi-colored or tooth-colored ligatures, for a personalized look. Ceramic Bracket Braces function exactly like traditional braces but use clear or tooth-colored brackets and wires to offer a less noticeable appearance. Keeping a consistent brushing routine will be necessary to avoid staining these clear brackets. Lingual Braces feature brackets affixed to the inside of the teeth for the utmost discretion. While this is an attractive option for some, this method may not work for more severe misalignments. Invisalign® Clear Braces (including Invisalign Teen® and Express®) are custom-made, clear trays used to straighten teeth are removable, allowing you to eat or drink without complication or interrupting results. When worn for the recommended 22 hours each day, these trays will straighten mild to moderate misalignments for adults and teens. SureSmile® is a braces option using digital planning tools to customize the straightening process for the most precise alignment and a faster treatment time. A patient generally only needs one or two wire changes during the entire treatment. Damon® Braces are a self-ligating appliance that uses a slide mechanism as opposed to rubber bands for a faster and more comfortable feel. MTM® Braces have a unique open pathway to allow teeth to move more freely to their correct position. Patients can be treated at our Van Nuys office or take home a starter kit for their convenience. Our goal is for you to leave our office with confidence in your teeth. By offering a variety of braces options at one location, we can correct the alignment of your teeth with convenience and efficiency. In addition to these options, we can handle more complex circumstances, such as interceptive and two-phase orthodontics. Once your teeth are fully aligned, our team will educate you on proper care and maintenance. We will also fit you for a retainer that helps preserve the integrity of the work done over treatment. At follow-up appointments, we can adjust the retainer so that it remains comfortable and effective. If you have questions about the best way to straighten your teeth, our dedicated staff at Affordable Dental has the training and expertise to provide you with the smile you’ve always hoped to have. We provide orthodontic care to patients ages eight to 80 in Van Nuys, Panorama City, Reseda, and the surrounding cities, so call us today to set up your initial consultation.